Lands End Science Shirts for Girls? 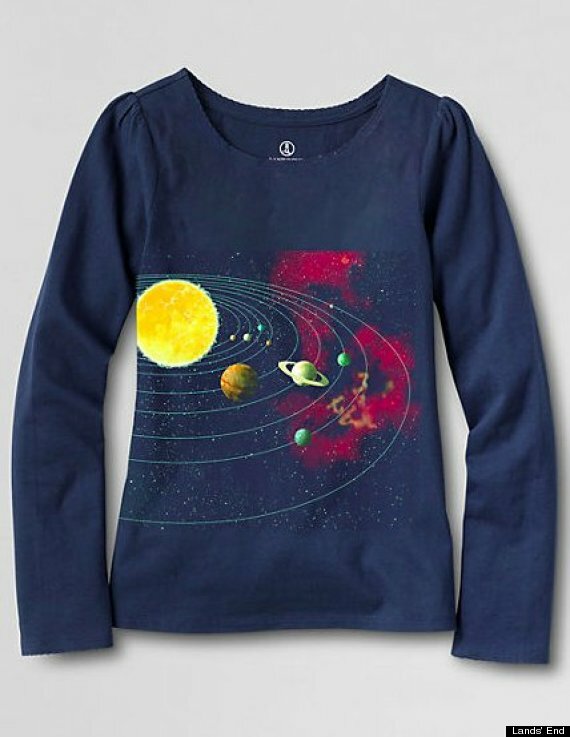 While I appreciate the efforts of Lands End and their responsiveness to the customer base in making their new line of science t-shirts for girls, I don’t quite understand why this is necessary. I totally want more science stuff for girls; what baffles me is the need for separate ‘boys’ and ‘girls’ sizing on t-shirts. A t-shirt is a t-shirt. And boys and girls are shaped roughly the same until puberty. My daughter is skinny, but got my broad-shouldered build. ‘Girl’ t-shirts usually end up too short and too tight in the shoulders long before she outgrows them anywhere else. This is especially a pain with long-sleeved shirts – we have to go up a size to fit her shoulders, and then roll the sleeves up. So given a choice, I just buy her ‘boy’ shirts anyway. Plus, you know, there’s her Spiderman obsession, and I have yet to find a ‘girl cut’ Spiderman shirt. So if you’re only looking for more ‘feminine’ styled shirts for your kids (i.e. slim-cut shirts with teeny shoulders that have cute little gathers in them), these Lands’ End t-shirts may be for you. And if not, we can all continue to ignore the fashion industry’s desire to make more money off gendered clothes and just buy ‘general kids play clothes’ – which unfortunately seem to only be in the boys’ department still. Do you only shop for your kids in the girls or boys department, or do you venture across the aisle once in a while? What do Gender Reveal Parties Reveal About Us? Ok, today I’m dipping my toe into the waters of blog posts that will probably get me hate mail. The first big opinion piece that is likely to spark a *ahem* lively conversation. So… gender reveal parties. The reveal takes many forms – cakes with blue or pink filling, blue and pink drinks, Oreos with blue or pink filling, secret envelopes with ultrasound pictures, and even moustaches vs. hair bows (this one especially gets rankles – a ‘manly’ object vs. a ‘little girl’ object is such an awful contrast). There are usually games, secret ballots, extraordinarily creative ways to break the news, and people choose sides for “team pink” or “team blue.” Gender reveal parties are all the rage for the pregnant/expecting crowd these days. There are articles, pinterest sites, parenting blogs, entire websites even dedicated to these parties. Does it matter? Shouldn’t the focus be on the fact that it’s a brand new human life you’re growing in there? What does it say about us that the focus – earlier and earlier, now – is on pink vs. blue, boy vs. girl, dividing our kids into boxes and sets of strict expectations before they are even born. Are we planning in advance to value one over the other, whether we do so consciously or not? Why is gender the most important thing to know about a new baby? Wouldn’t you rather talk about hopes and dreams for your child, or your plans for childcare and feeding, or your favorite parenting books and the best advice you have gotten? Why is gender the single biggest focus? It’s not like science has gotten us to the point where we get to choose in advance just yet. And if you’re going to the trouble of having a gender reveal party, it’s fairly safe to assume you really want the baby. Will you love the child less if the gender turns out to not be your first choice? I know this is a reality in many parts of the world, but I have high hopes that eventually it won’t be that way, especially not in the U.S. So help me out with some fun and more productive alternatives here – instead of a gender reveal party, how about a “guess the personality type” party or a “predict the future occupation” party – or something else that’s equally out of our control but perhaps a little less divisive. Or you could even make it something constructive and have a “bring the book that influenced your childhood the most” party. Please share in the comments – what are your thoughts on pink vs. blue and gender reveals? Have you had one of these parties, hosted one, or attended one? What is the upside? Did you have a gender preference when you were expecting your child?